Synblend Refrigeration Ammonia Compressor Oil is specifically designed for use in industrial closed loop ammonia refrigeration systems. Synblend is blended from highly refined paraffinic base stocks and select additives. Synblend consistently outperforms conventional naphthenic and solvent refined mineral oils in rotary screw and reciprocating compressors in ammonia refrigeration applications. 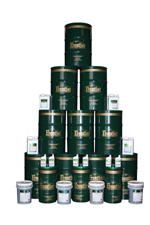 Synblend is formulated using Group II+ hydro-treated base stocks. These base stocks contain less than one percent of the impurities typically found in naphthenic and solvent refined mineral oils. Synblend is superior to naphthenic and solvent refined mineral refrigeration oils in the critical performance areas of lubrication, thermal stability, and reduction of oil carryover. The Group II+ Base Stocks used in Synblend maintain a stable viscosity, reduce sludge and harmful deposits and provide maximum protection to critical compressor components. Synblend Ammonia Compressor Oil is specifically designed for use in industrial refrigeration closed loop ammonia (R-717) systems. Synblend is designed to have a minimum mixing of oil in the refrigerant. This reduces the amount of make-up oil and reduces the amount of oil that must be removed from the low side of the system, downstream from the compressor. Synblend greatly reduces equipment wear, labor costs and annual oil costs.